Adapting the Medium: Debunking the Comic Book Genre – AiPT! It ain’t all about capes and origin stories, folks. There’s a scenario that plays out all the time in the grand comics universe. Hollywood announces a brand-new film or TV series, and before the last syllable slips out, people respond with righteous indignation. Perhaps part of that has to do with expectations surrounding comics film. As if all the scripts are cranked out on some grand assembly line. That every film requires X number of capes, a balance of emotional earnestness and CGI, and the chiseled good looks of a star or starlet. And those ideas mean that these films have wildly unattainable benchmarks for success, and that’s why they often seem doomed from the start. The reality is that comics aren’t a genre at all, but rather a diverse toolbox of new stylistic techniques for TV and film that provide the basis for proper adaptation and new levels of storytelling wizardry. Ideas and visuals that can be used to uncover unseen truths and help us better understand ourselves and one another. Comic books can enhance other media both visually and in overall style. Beyond DC and Marvel’s slew of entries, Outcast, Deadly Class, The Umbrella Academy, and Happy!, among others, are all adaptations that exemplify a new wave occurring within the worlds of film and TV. Part of that is that the essence of comics (things like panels and overall pacing) are built for perpetuating stories. Panels, for instance, exemplify moving through space and time simultaneously, and bringing that to a screen is a way to push artistic boundaries forward. Comics can add visually unique styles to TV shows and movies by using animation to push creative boundaries. Spiderman: Into the Spiderverse earned high marks for its distinctive style of animation, one that seamlessly brings the comic book panel into an animated movie. Textually, the movie looks and feels just like a comic, utilizing the same techniques as line artists, flatters, colorists, and even letterers to bring Miles Morales and his world to life. A lot of animated movies look very little like the source material (if there are any), but Spiderverse’s animation looks as if artist Sara Pichelli drew every scene herself. Comics are special because there are no explicit rules to their structure, and visually emulating them often means throwing out traditional methods of animation and film. Spiderverse embraced that freedom to create something truly special, and there’s nothing formulaic about that. Other shows are also using visual qualities and techniques common in comic to enhance their stories. It’s very rare to see a show that successfully combines live action and cartoon animation, but Happy! 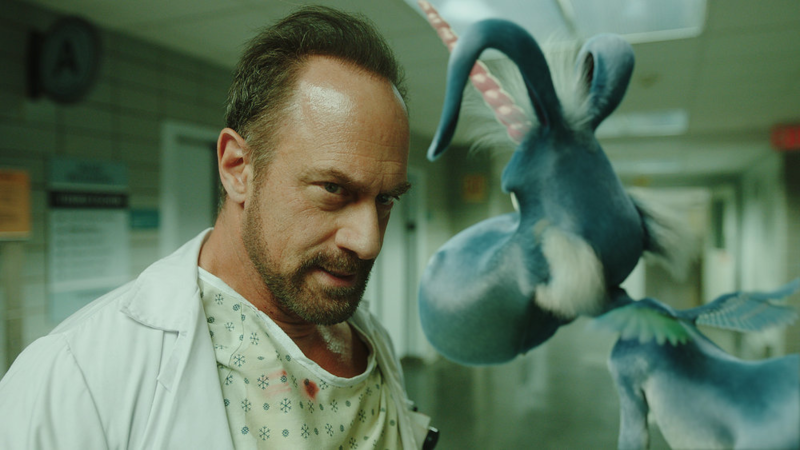 was a huge success by simply including a blue cartoon unicorn into their gritty crime drama. Sure, Happy! contains other larger-than-life elements on a smaller scale, but a blue unicorn that steals the show is an intentional and eccentric choice used to emphasize the grounded and mature themes by contrasting the two visual styles, and it worked like a charm. The surreal supplements the real as to further convey the show’s message, an important tool largely pioneered by comics. Other mediums/genres have accomplished just that, but comics streamlines the process and plays up the dichotomy like fewer other approaches could ever. Deadly Class and The Umbrella Academy a far more direct route by adding actual comic panels as scenes during certain episodes with flip-book style animation. This approach highlights the original artists who brought these ideas to life while also showing a wider audience the subtle but effective power of comics. There is no other style that could portray the scene where Marcus’ parents are killed by a woman who jumped off the Golden Gate Bridge and landed on them better than the original Wesley Craig artwork. Sometimes its necessary to respect the craft, but more than that, it exposes viewers to different forms of media, art, and storytelling. Comics break the ground open and let the world see the possibility of other ways to consume and filter the world. We are in a golden age of comic book content landing across all media. It is reaching eager new audiences, pioneering fresh visual styles, and telling a wide variety of essential stories. Let’s stop pretending that all adaptations are the same, and start respecting and appreciating the toolbox that comic books bring to the table. A new era where we recognize the influx of comics and related ideas into films and TV as the genesis of fresh creativity and exploration. Sure beats that 1,000-word Rotten Tomatoes review bemoaning another “unoriginal” comics flick. Action Comics #1008 review: The D.E.O. Spider-Man’s rogues gallery, the Savage Six, to be tested in Amazing Spider-Man #16. To the death?